Are Religious Groups Increasingly Out Of The Loop In Assisting Local Need? Prior to the 1940s religious groups were at the heart of providing financial and pastoral care for those with specific need in their community (see attached list for typical examples). This participation has reduced considerably due to the creation of the welfare state and changing attitudes to religious institutions. One consequence is that local religious groups no longer possess what might be called "Knowledge of Need" (KoN). Knowledge of need - KoN - is a general description referring to the multitude of requests for assistance, that used to turn up at local churches, however this KoN tends to turn up at "Duty Social Work" offices, Doctors surgeries, local authorities "Homeless" units etc. meaning the churches can often be unaware of needs within their local community, amongst the non-church going congregation. Those in need often approach directly a social work department. After a process of assessment by trained social workers an attempt will be made to meet the need(s). Often the State is unable to provide adequate resources to alleviate the whole need. With the permission of the person in need, a frontline worker will increasingly approach national charities/trust funds etc. on behalf of the client to augment State resources. Invariably, local religious groups remain outside this process - unless they create a small fund like a charity/trust fund and provide resources to help solve the problem. ERGC has gained the trust of the Social Work Deptartment and so permission is increasingly sought from those in need to share the KofN with ERGC. While ERGC makes a valuable impact with a small financial or practical contribution, frequently the spiritual and ongoing pastoral need of the client remains unmet. It is in this regard local religious groups have a valuable contribution to make in their community. ERGC has found that many clients are happy for ERGC to approach a local religious group on their behalf. Synagogues and Roman Catholic congregations are able to draw from specific denominational funds and have worked alongside ERGC. Other denominations however, have no such access to funds. 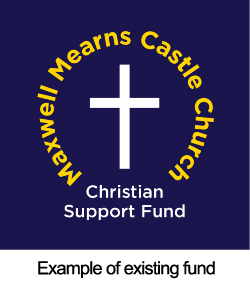 Our hope is that an increasing number of congregations will create a fund specifically for this purpose locally. This has already been done successfully in one community by a Church of Scotland congregation. ii. work alongside ERGC (who has access to this KoN) in your community. The amounts of money need not be great. However, the impact in love and care can be considerable. Moreover, as these relationships develop in a trustworthy and reliable manner maybe one day frontline social workers might go directly to the local congregations with a fund by-passing charities like ERGC. 7 - Resource Providers can contact client with KON to assess suitability for their resources. It is at point 6, that the religious group becomes aware of the client and their KON. If the religious group is not a potential resource provider, then it is not made aware of the needs of a neighbour in their own area, whereas benevolent funds, Rotary Clubs, National Charities receive this information, however the church does not. Note - At present, the Catholic Churches have "Saint Vincent de Paul" groups within each chapel, Jewish Care have a fund for this, however very few Church of Scotland's appear to have this "resource pot" for workers to apply to, hence they miss out on the knowledge of need, and the chance to Love their own neighbours (other than the existing church going congregation). KON is the key to outreach and loving your neighbour in a modern, western community. Giffnock Community Council and Giffnock Village Business improvement District (BID) are jointly fundraising to acquire a public access defibrillator to be located centrally in Giffnock. There is currently a crowdfunding appeal which can be accessed by clicking on this link. More information can be downloaded here (Word). 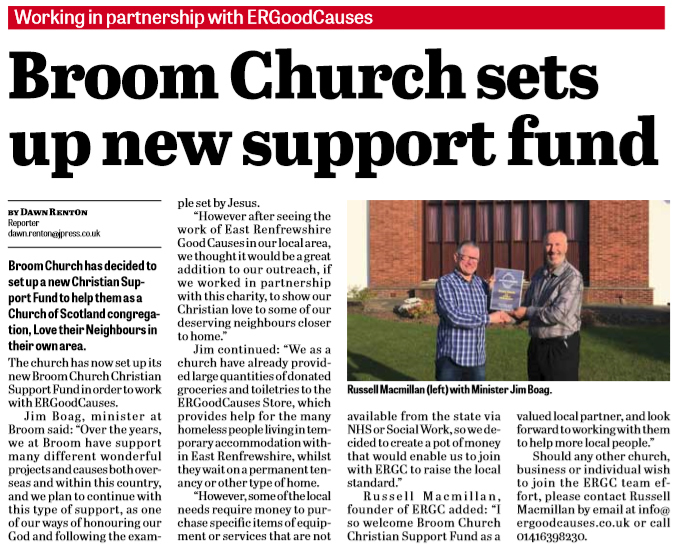 In following East Renfrewshire Good Causes (ERGC) ethos of encouraging us all to "Love our Neighbours" the charity is highlighting an access problem, both on behalf of residents of local semi sheltered housing complex in Newton Mearns, and many similar complexes across East Renfrewshire. 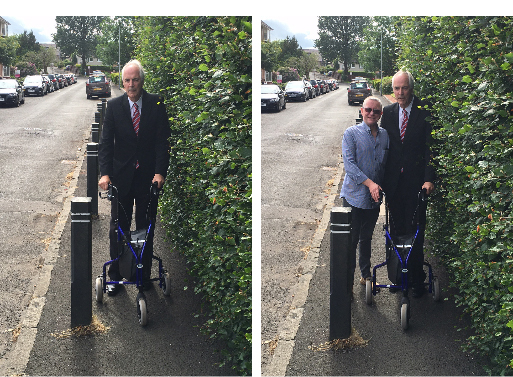 "With an increasingly ageing local population, it is essential that our pavements and kerbs which allow basic daily tasks like going to the shops, take account of difficulties faced by the elderly, parents with prams and mobility impaired disabled people. For the elderly, both uneven and the camber on the pavement can be a real disincentive, and can lead to many using the roads instead, which poses a real potential danger". "The things we take for granted can become more problematic with the ageing process. As a registered blind man myself, I am only too aware of how easy it is to take things for granted, as I did prior to losing my eyesight, to its current 4% level. With ageing, often comes difficulty with balance, strength and an increase likelihood of falls, which can be disastrous for the elderly, and lead to hospital admission, becoming housebound not to mention the psychological loss of confidence. With this in mind, Russell approached local labour councillor Ian McAlpine, to look into this issue on behalf of the many residents potentially affected both now and in the future". "When you walk the route with a stroller, you quickly realise the obstacles that our mobility impaired local residents face, when carrying out such a basic daily task like going shopping. In my role as labour councillor for Newton Mearns South, I am naturally delighted to spearhead this latest ERGoodCauses appeal to improve access for my constituents, which will raise the local standard". 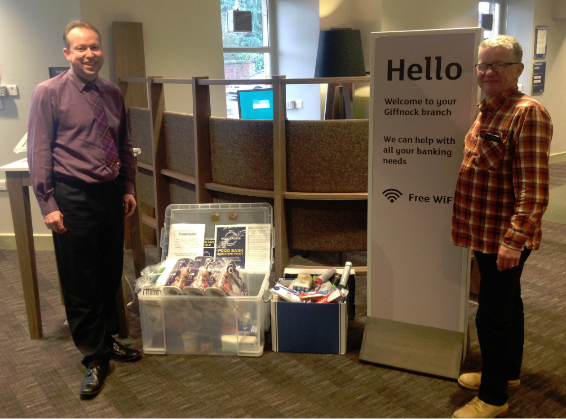 "it is good to see councillor McAlpine trying to help improve the lives of some of our senior members who live independently in the community". Imagine waking up as a child on Christmas Day to no toys, gifts or a hot meal. Every child deserves gifts on Christmas Day no matter what their circumstances are. Now imagine that your generosity has turned that sad face into a bright happy excited child on Christmas morning. Giving is the true spirit of Christmas! Can you donate just one gift? Glasgow's Spirit of Chritmas children's gift appeal was created to support children living in poverty and hardship in and around Glasgow and launched at the end of October 2014. We would love to see a group in every region because the sad reality is that 1 in 5 children (210,000) right here in Scotland lives in poverty and that figure is set to rise over the coming years with a massive increase forecasted in child poverty by 2020. Hi everyone, as you know we like to try and do our bit for charity. So as we are not doing an event for Christmas we thought we would try and help out another way. 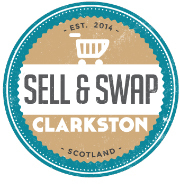 Sell and Swap Clarkston are teaming up with the amazing East Renfrewshire Good Causes for a fantastic appeal to try and help out some vulnerable people in East Renfrewshire. A lot of people don't realise that there are many homeless people in the area and we have decided to try and help out in a small way. 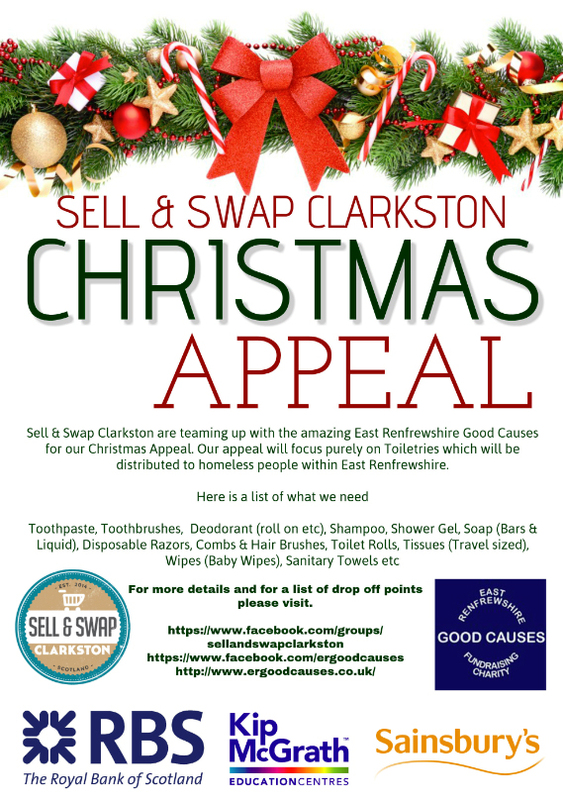 Our appeal will focus purely on Toiletries. Toiletries are one of the things that people need and use daily and its something everyone should have no matter your circumstances. We know that other things can be donated but we would like to focus on this and get as much as we can. We are hoping that people could pick up one or two things when they are doing their weekly shop and donate it as it would help out massively. 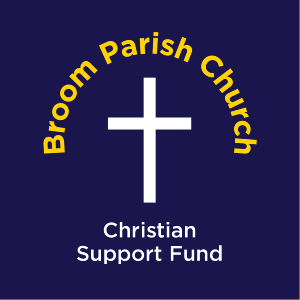 We are also looking for local businesses who would like to help out by being a drop off point so that we can try and cover the whole of East Renfrewshire if possible, so if you would like to help out that way please drop me a wee message. Ok so here is a little list of the type of thing we are looking for, now we don't need expensive brands just anything you can give will be greatly accepted. We need everything in both Adults and Kids and Male and Female so you can donate whatever you want. 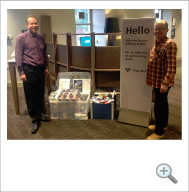 The Royal Bank of Scotland in the following branches will accept donations. 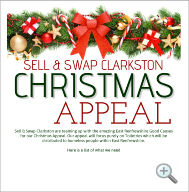 Please can you mark all donations "Sell and Swap Clarkston Christmas Appeal". 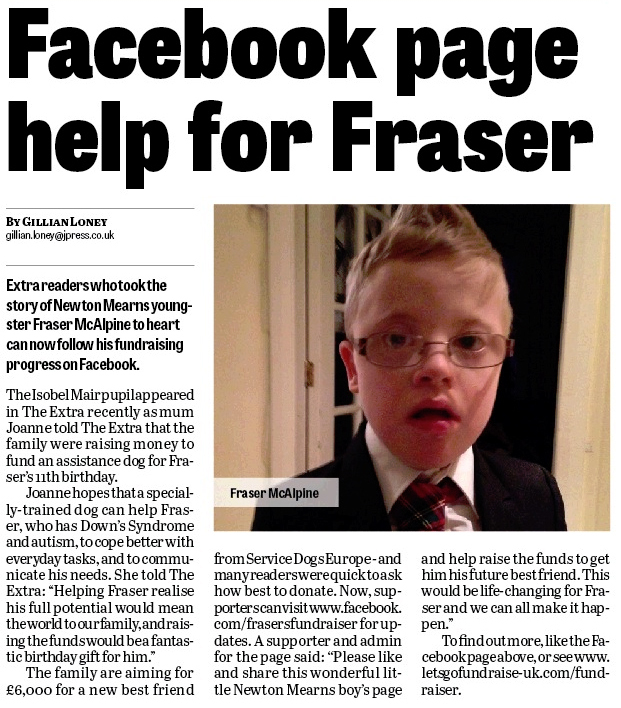 Fraser is 11 years old and has Down's Syndrome and Autism. 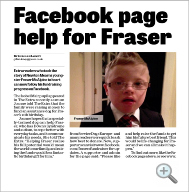 He attends Special Needs School and cannot speak. 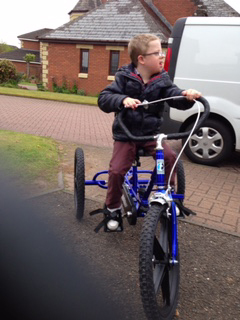 Due to Sensory difficulties, he cannot tolerate teeth brushing, haircuts and can only eat food with "baby food" texture. He cannot tolerate going on some family outings (especially to certain shops) and frequently has "meltdowns". A service dog can help him by calming him and stopping him running off (by "anchoring" him. It can help his independence skills and a sense of "ownership" and "empowerment" by being responsible for the dog. This may help his communication and social skills. 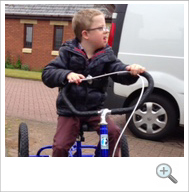 Visit the justgiving page to donate.